Codell, in Rooks County about 34 miles northeast of Hays, now has less than 100 residents. The steel sculpture was dedicated on May 20. “It was also very emotional because this is a part of their families’ history. They lost family and friends on this day and we were also there to remember them,” he said. About 150 people attended the dedication, which included a band, speeches by Merril Teller and Joel Russell and a cookout. People brought newspaper clippings and old photographs from the time of the original cyclones. 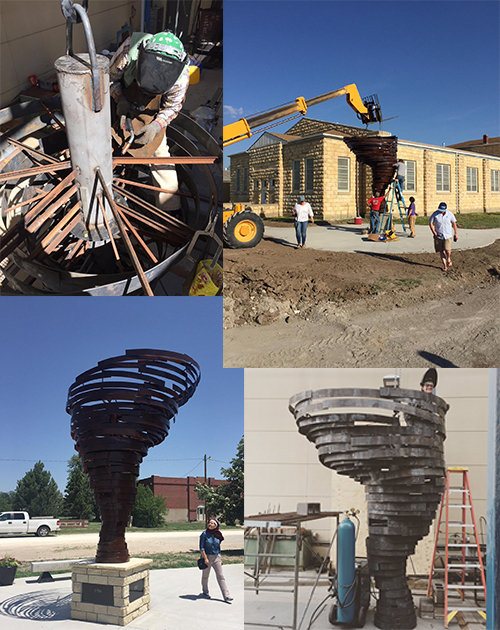 Flores and Robinson have created four local public sculptures together, including St. Nicholas at the St. Nicholas of Myra Catholic Church, the golfers at the Smoky Hill Country Club and the historical door stops at the Hays Convention and Visitors Bureau building.